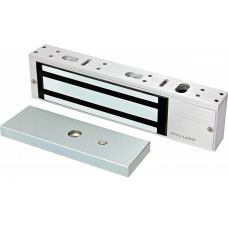 The E-941SA-1K5Q 1,500-lb Single-Door Electromagnetic Lock is the ideal way to secure a door against unauthorized entry. When power is applied to the electromagnetic lock, it creates an extremely strong magnetic field. The electromagnet is strongly attracted to the steel armature plate which is mounted on the secured door. Once the electromagnet is deactivated, the secured door will function normally without any residual magnetism.